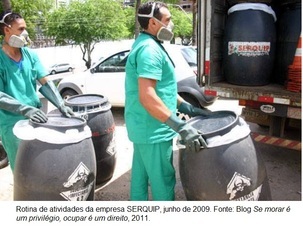 In November 2003, the Secretaria Municipal Adjunta de Meio Ambiente (SMAMA) granted operating license to the company SERQUIP Waste Treatment Ltda. of a health care waste incinerator. In 2004, the company has also obtained license to process industrial waste. According to the residents of Camargos, the licensing process occurred without the community being informed. After two years of operation, the inhabitants began to realize that the incidence of respiratory diseases and skin cancer cases among the community was growing. They mobilized in search of information about the activities carried out by SERQUIP and discovered what the company was processing in the incinerator. Residents of Camargos resisted against the incineration of health care waste and industrial by SERQUIP company, responsible for many health problems to the population. They made the company withdraw from the project in November 2009. Now the fight goes on and challenges the accountability of the company for long-lasting damage to health with the help of the Study Group on Environmental Issue (GESTA) and teachers of the Department of Social and Preventive Medicine, Universidade Federal de Minas Gerais (UFMG). Relevant government actors Secretaria Municipal de Meio Ambiente (SMMA) de Belo Horizonte; Ministério Público Estadual de Minas Gerais (MPE/MG); Comissão de Direitos Humanos da Assembléia Legislativa de Minas Gerais; Defensoria Pública do Estado de Minas Gerais (DPMG); Fundação Est, Fundação Oswaldo Cruz (FIOCRUZ). Other Damage fetus development, respiratory diseases and cases of cancer. Why? Explain briefly. The case is successful as SERQUIP withdrew, but the diseases and contamination remain and affect people and the environment. Resolution 02/360 do Conselho Nacional de Meio Ambiente (CONAMA). SMAMA. Secretaria Municipal Adjunta de Meio Ambiente de Belo Horizonte. Parecer Técnico N. º 1237/08 das Gerências de Licenciamento Ambiental de Empreendimentos de Impacto (GELA) e de Licenciamento de Comércio e Prestação de Serviços (GELP). Belo Horizonte, 2008. SMAMA. Secretaria Municipal Adjunta de Meio Ambiente de Belo Horizonte. Processo n° 01-031707/03-10. 2003 [Consultado em 4/05/2009].